Also known as the peace lily, this dark leafy plant with its delicate white blossoms makes a simply elegant gift. There's nothing small about the sentiment delivered along with this pretty plant. 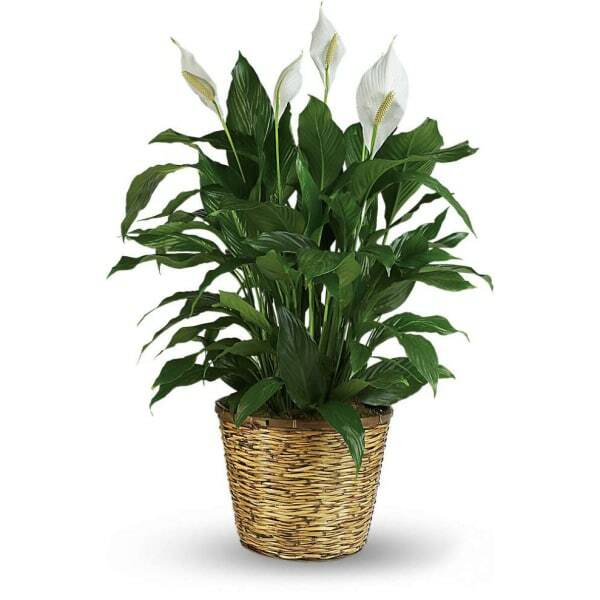 Known for its indoor beauty, its ability to clear the air of contaminants and for being a low-maintenance house plant, the Simply Elegant Spathiphyllum is a wonderful way to honor the memory of someone close to you. 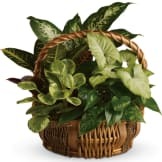 • A brilliant green spathiphyllum is delivered in a natural wicker basket. • This sympathy plant will be hand designed and delivered by a local florist. • An appropriate gift from a family member, friend, or business associate. • Can be sent directly to the funeral home or to the family's residence. Flowers will be received by a Green-Larsen Mortuary, Inc.'s staff. Was even bigger than we imagined and so full and healthy. Looked absolutely beautiful. This plant was absolutely beautiful and the family was thrilled to receive it. They sent a picture of it and it was much bigger then I had thought. Thank you for your outstanding services. This was the easiest flower order that I have ever done. During grieving the task of ordering flowers seems to add stress to the day of needing correct information and wondering if they arrived. This was a simple click right on the obit and it was done! The plant was beautiful. Thank You for making this order so easy! I was very pleased with my recent purchase. It arrived on time and was a beautiful plant. 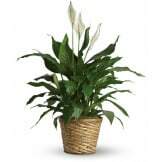 Our family was exceptionally pleased with the Simply Elegant Spathiphyllum that arrived in plenty of time for our Uncle's Visitation and Funeral. Thank you so much! 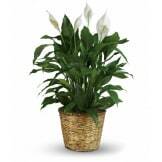 We have loved "Peace Lily" plants for many years, and have owned several -- but this was an especially lovely one, in full bloom, great health, and looking just like your photograph. We could not have been more pleased. I was worried because I ordered on-line in the evening for a service at 2:00 the following afternoon. I therefore called in the morning and the lady I talked to was so helpful. I'm told the plant was absolutely beautiful. The Sympathy Store did an excellent job. The plant was beautiful, and it arrived when promised. I was very pleased. The ordering process was very easy and convenient. I would recommend using it. Very pleased with my order. I had placed an order for a funeral in a different state. The family commented how nice the plant was. The Sympathy Store had the plant to the funeral home before the 10am visitation, even though I had not place the order until after 9pm the night before. Thanks so much for providing excellent customer service. Ordered this through the Sympathy store. The plant was beautiful and arrived on the same day. I would recommend this service to anyone who needs to send gifts to freinds or family that have experienced the loss of a loved one. We never saw this in person; however, we were sent a text pic of it. In two words.... absolutely gorgeous. I would purchase from here again. Beautiful large plant. Was what I expected. Loved the ease of ordering, although a little pricey, would do it again. This was a beautiful plant and I feel it gave great comfort to my dear friend in her time of sorrow. Thank you for an easy ordering process and a beautiful plant. Family loved the plant. Medium suze was much bigger than I'd expected. 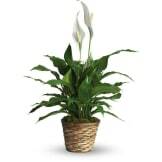 I recently ordered a medium Spathiphyllum & was extremely happy with the purchase when I saw it. The plant was a lot bigger than I thought it would be too. It arrived in the short time from when I ordered it to when the service was being held. When I need to order a plant again, I will definitely use The Sympathy Store. Simple to order and great quality. We were unable to attend the funeral of a dear 103 year old lady who was unforgettable. She made and shared the BEST pound cake I have ever eaten for over 30 years of my life. She will be greatly missed. The Sympathy Store made it so convenient to send a beautiful plant in time for the service. The plant delivered to the funeral home for my Uncle was beautiful. It was larger than I thought and looked very healthy. I will use this site again. The arrangements were short notice, the order was placed Sunday evening for a Monday afternoon service. The order was delivered in time for the service. I was very pleased the family knows our prayers and condolences are with them during this difficult time. I didn't see the arrangement however I understand it was very nice, and a keepsake for the family. Look great . they love it . I had a wonderful experience with this online process. It was simple, efficient and the pictures were exactly what the product looked like. I was not able to order my plant until about 11 hours prior to the funeral service, yet it was still delivered on time and it looked great. Two thumbs up! This is my first time using this service. It was very easy, fast and convenient. I would use again. The plant that was sent was a little high for the size plant that was there. Did not attend service. Happy with how the process worked. 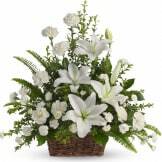 It was VERY convenient to go on the Funeral Home website & have the option to purchase a plant for a wake I was attending in Cary, Illinois. The plant was beautiful & arrived on time & was very appreciated. Thank you! Plant was pretty but smaller than expected. I was happy with the size and ribbon but there were NO blooms on this plant it was all leaves. This plant was absolutely stunning. It was much larger than I expected and was in perfect condition. Even though I placed the order barely the day before the memorial it was delivered way ahead of time. The plant size reflects the photograph and I was not disappointed, of course one has to realize that the plant will no necessarily be in bloom. I wish it had been dressed up a little more, but overall I was pleased and so was the family that got it and can keep it for years to come. Simple and easy to use. Didn't have to find florist on my own. Thank you. This plant looked very nice. This was a very appropriate plant and was well received by family. They liked the fact they had something to keep. The plant was perfect. It was very pretty.Nice basket for the container. Excellent choice for any occasion. The plant was very nice and fit my budget. It was delivered to the funeral home and was displayed on a stand. All of our flowers are designed and delivered by hand from a local florist in in International Falls.